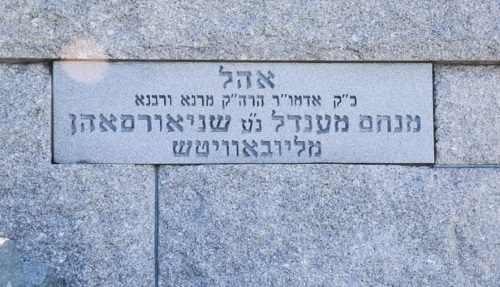 "The Ohel" is where the Lubavitcher Rebbe, Rabbi Menachem M. Schneerson, of righteous memory, was laid to rest on the 3rd of Tammuz, 5754 (June 12, 1994), next to his father-in-law, the sixth Lubavitcher Rebbe, Rabbi Yosef Y. Schneersohn, of righteous memory. The term Ohel (lit. "tent") refers to the structure built over the resting place of a tzaddik, a righteous person. It is also known as the tziyun (marker). During our long, painful journey through history, the holy resting places of our righteous forebears have served as spiritual oases. While Jewish law and tradition dictate that a person direct his prayers only to G‑d, and not to any other entity, the resting place of a righteous person is considered hallowed ground, a place where ones supplication to the Almighty are heard in the merit of the holy soul connected with this place. Gravesites such as Mother Rachel's and King David's, referred to in the Bible and Talmud, have provided solace to millions. During the Rebbe's lifetime, he would frequent the resting place of his father-in-law, the sixth Rebbe (Rabbi Yosef Y. Schneersohn), sometimes two, three, four, or even six times a week, bringing people’s troubles and prayer-requests to the holy resting place. The Rebbe responded to hundreds of thousands of people by writing (in Hebrew), "I will mention [your request] at the tziyun." He would painstakingly read every single of the thousands of notes, then tear and leave them at the grave, perhaps as a physical memento of the supplicant. Now chassidim, Jews and non-Jews from all walks of life come from around the world to the Rebbe's resting place for blessing, spiritual guidance and inspiration. But, most importantly, one goes not to the Rebbe without the minimal preparation of charity giving, Torah study and some degree of spiritual stock-taking. "The righteous are greater in death than during their lifetime," say our Sages. Commentaries explain that while freed from their physical limitations they are able to be even more unconstrained in their concern for us left down below. 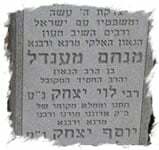 As in the Rebbe's lifetime, stories abound of miraculous reprieve resulting from a gravesite visit. This should come as no surprise as we recognize the Rebbe's life-span as a continuum of spirituality and holiness. While on this earth the Rebbe related to G‑d on higher planes, and our Sages tell us that after leaving the physical constraints this only intensifies. But as during his lifetime, praying in the Rebbe's presence has not only a salutary, redemptive effect, but motivates and charges one to continue, indeed to strengthen, one's thought, speech and actions in the realm of goodness and kindness. In fact, again as in the Rebbe's lifetime, many carefully observe the custom of adding a resolution to enhance one's mitzvah observance to a letter one writes to the Rebbe; these are the "conduits" through which G‑d's blessings can flow. The visceral experience at the Rebbe's gravesite has the potential to fuse the supplicant and the Rebbe together in spirit, in an experience of unmitigated truth. One stands before the Rebbe sensitized and uplifted to examine one's relationship with G‑d and purpose on earth. One prays for the spiritual and physical wellbeing of one's own self, one's loved ones and the entire Jewish People. Many who remember the Rebbe go not only to pray, but to re-experience, relive the moments of spiritual elevation one had in the Rebbe's presence in his lifetime. One cannot help but be affected, be charged with a renewed, uplifted spirit, a deep sense of renewal. Why Pray at a Grave? healin prayer for my brothr please pray for my brother, he suffered mental illnes and been in the hospital now for a year. i am told by a doctor that he will take medication for the rest of his life. i have a hope that as god is a living god, he will heal him and will again live a normal life. Re: Cohen visiting the Ohel While there is an opinion that the standard restrictions do not apply to the bodies of holy tzaddikim. This is not the accepted halachic view. The reason the reason why kohanim may enter the Cemetery to visit the Rebbe's Ohel is because fences separate the walkway to the gravesite from the rest of the cemetery. In the actual Ohel, the actual grave is surrounded by a wall specifically so cohanim can visit.